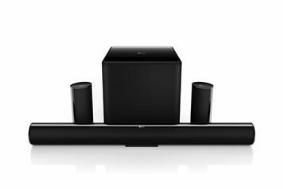 KEF expands home cinema soundbar range | What Hi-Fi? Designed to complement 32in flatscreen TVs, the system comprises a HTF7003 soundbar with front left, right and centre speakers, combined with a pair of compact HTS7001 satellite rear speakers and a 200W KUBE-1 subwoofer. Each of the three front speakers uses a 5cm woofer and 19mm high-frequency driver, and the same units are fitted to the rear surround speakers. The KUBE-1 subwoofer has a 20cm long-throw bass driver and a 20cm auxiliary bass driver powered by a 200W Class-D amplifier. The KEF KHT7005 is available now in gloss black, and comes supplied with a wall-mount bracket and table stand.